Natadola Bay Championship Golf Course has partnered with the Intercontinental Fiji Golf Resort & Spa, Fiji Marriott Resort Momi Bay, Yatule Beach Resort & Spa, We also have stay & play packages available at Shangri-La’s Fijian Resort & Spa & The Sheraton & Westin Resorts on Denarau. 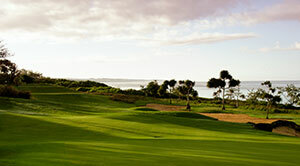 When looking to “Stay & Play a Round in Paradise” we suggest you look at these properties first. Intercontinental Fiji Golf Resort & Spa – Nestled amongst 35 acres of tropical gardens, InterContinental Fiji Golf Resort and Spa is located on the beautiful and picturesque Natadola Bay on Fiji’s main island of Viti Levu. Protected by a reef to create an aqua-blue ocean-facing lagoon, Natadola Beach has been voted one of the best beaches in the world. InterContinental Fiji Golf Resort & Spa is the only five star resort positioned on the idyllic location of Natadola Bay. There is a complimentary shuttle which runs half hourly between the resort and golf course. For more information on the play and stay packages please telephone + (679) 673 3300 or visit the InterContinental Fiji Golf Resort and Spa website. Fiji Marriott Resort Momi Bay – Unparalleled paradise awaits guests visiting the Fiji Marriott Resort Momi Bay. Located in Nadi and perched on the blue waters of Momi Bay, the five-star resort is the ultimate island retreat. Check in to one of the over-water villas and check out of the ordinary. The resort features an array of luxury facilities, including a jaw-dropping infinity pool, three on-site restaurants, a fitness center and a luxury day spa. Book your trip to the Fiji Marriott Resort Momi Bay and prepare to experience the easy luxury of island living.